Liverpool captain Steven Gerrard says the next month could be the biggest of his career as the Reds prepare to play "four cup finals" in their bid to win a first English title in 24 years. They beat Manchester City 3-2 on Sunday and will take the Premier League title if they win their last four games. "It's probably going to be the biggest month of my career coming up now. I'll give it everything I've got," he said. "The message is to stay calm - there are still four cup finals left." The 33-year-old England captain added: "I feel 21 again, playing with all these top players." A one-club man, Gerrard has won the Champions League, FA Cup and League Cup during his Reds career but a league winner's medal has eluded the midfielder, who made his top-flight debut in November 1998. However, the victory over Manuel Pellegrini's side means leaders Liverpool remain two points clear of second-placed Chelsea, who are still to visit Anfield. Manchester City are a further five points adrift with two games in hand. Raheem Sterling's composed finish and Martin Skrtel's near-post header gave Liverpool a 2-0 advantage over City before they were pegged back through a David Silva shot and Glen Johnson's own goal. But Philippe Coutinho's late winner secured a 10th league victory in succession for Liverpool, on the day Anfield marked the 25th anniversary of the Hillsborough disaster. 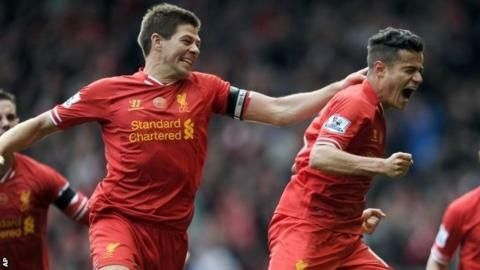 "I think that's the best we've played all season," Gerrard told Liverpool's website. "For the first 30-35 minutes, I thought we blew the so-called best team in the league away, and it could have been three or four. "I don't think 2-0 is ever enough against the top sides in this league. But it's all about getting the job done, no matter how you do it, and thankfully we got it done in the end. "It's probably the biggest statement we've made so far this season." Liverpool are away to Norwich next before hosting Chelsea. They then face a trip to Crystal Palace before ending the campaign at home to Newcastle. Reds manager Brendan Rodgers said he and his players would not look "too far ahead" and that there were still "a lot of points to play for". "My message to the players is to continue. We don't need to change," added Rodgers. "We showed a great mentality. The group is very, very tight. There has to be a cause to fight for and you could see that intensity."